Summer's here and heat waves are on the way! Who ya gonna call when Mother Nature leaves the oven door open? Thanko, of course! 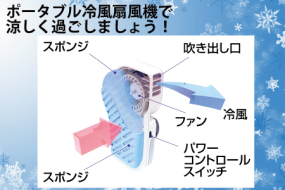 Japan's leader in over-the-top USB quality-of-life enhancement products has come up with something sorely lacking in the consumer appliance sector: a small, portable air conditioner. Don't think there's a need for so-called “personal AC”? Obviously you've never suffered through a power outage caused by an overloaded electrical grid crashing on a blisteringly hot day. Maybe you just like a cooler space at home without provoking thermostat wars with the family, or you've sat through one too many afternoon baseball games in an un-shadowed open-air stadium. Thanko's portable liquid-cooled air conditioner may not pack the cooling power of an actual miniaturized 5,000 BTU window air conditioner but it should offer some relief to salarymen stuck on steamy subway trains, students struggling to keep focused in clammy classrooms, and campers desiring to turn their pup tent into an anti-sauna. Thanko is offering the Portable USB Liquid-Cooled Air Conditioner for a tax-included 1,480 yen (around $18.75) each at their website. The units weigh 270 grams or just under 10 ounces and include a Japanese-language instruction manual – if you can get through an IKEA pamphlet you'll have no trouble. No freon is required, just water! Soak the included, trimmed-to-fit blue sponge so it's thoroughly damp and insert it into the cooler's plastic case. Flick the ON switch – if you've attached the included USB cable then power won't be drawn from the four AA batteries (sold separately) needed for cooling on the go. Air drawn through the damp sponge is chilled via the wonder of Evaporative Cooling and emerges through the unit's 90-degree rotatable front grill noticeably chillier than the ambient air temperature... so Thanko sez, anyway, but on a fry-an-egg-on-the-car-hood-hot, cloudless summer day, I Want To Believe! UPDATE: The USB Mini Air Conditioner is now available in the U.S. on Amazon.